The Nats 4th Outfielder is… Two Second Basemen! Alright so maybe the title is a bit of hyperbole, but here’s what’s been going on in the Nats OF recently. 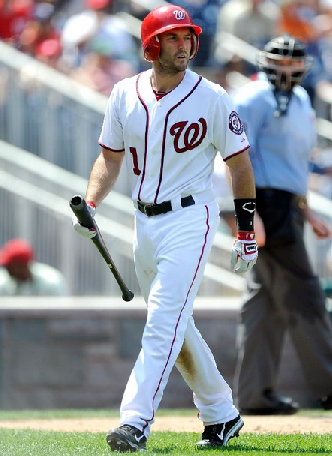 Steve Lombardozzi has started only 3 games in the last week – one of them at 2B, the others in LF. Jeff Kobernus has started 4 games in the outfield over the last week, and hasn’t played any infield. Roger Bernadina has started 2 games, both in the outfield. It’s as if Lombo and Kobernus are splitting the duties of a fourth outfielder. And it has been particularly important over the last month or so as their 3 starting outfielders haven’t been healthy at the same time. This isn’t an issue in itself, but when none of them are really hitting, it is worth questioning. The Nats bench has been pretty much awful all year, although it’s hard to really blame management for it’s initial construction. All the players did so well in 2012, especially with the amount of service they were forced into, that it wasn’t crazy to continue with the group. Unfortunately, it hasn’t worked out well for them. Now that Anthony Rendon seems to have taken up the role of full time second baseman (and I’m not even gonna talk about the purgatory that the Nats should probably leave Espinosa in right now), they essentially have three 2Bs on the roster. Yes, Kobernus started playing OF in the minors this year (28 of his 311 MiLB games are in the OF, all in 2013). Yes, Lombardozzi has played 1/3 of his 150 MLB games in the OF (he has none in the minors). But these guys are really infielders. They are utility men, and have a very valuable role with a team, especially a National League team. They can certainly play the outfield at a competent level when they need to, but neither are outfielders. With a combined 85 professional games in the outfield, it’s just not their position. They are, essentially, redundant, and have been wedged into positions that aren’t natural to them. Meanwhile, they have perfectly ambulatory outfielders in AAA Syracuse that might be better than the converted second basemen. One is Corey Brown. Brown has seen a little bit of time with the Nats, but not very much. He’s already 27, so he isn’t a prospect. He’s got some serious power, and while his batting average won’t be pretty, he has a decent enough eye to think he might be able to take a walk or two in the majors. He’s also a superb defensive outfielder, probably better than anyone else mentioned here. He’s got value as a bench player who could run into a few HRs while playing great D.
The other, perhaps more intriguing option, is Eury Perez. Perez is only 23, and he’s hitting .316/.338/.447 in AAA this year. He also played a few games with the Nats this year, but only got in 5 PAs. He has Kobernus-like numbers in general terms, as a guy who hits for average with little power. But he’s had a better average than Kobernus in the minors, even the high minors, and a better OBP, despite being 2 years younger. His 2012 in AAA at age 22 is almost identical to Kobernus’ in 2013. But the age difference indicates more chance of success down the road. In other words, if the Nats like Kobernus in the outfield, they should like Perez even more. To me, Corey Brown is almost the definition of a 4th (or 5th) outfielder. He’s got pop off the bench, might hit enough to play in short stretches, and plays CF. Eury Perez is potentially more than that. He might be a borderline starter, although he won’t hit like either of the corner guys and probably will never do what Span can do, he is young enough to be considered a potential starter on a second division squad. Again, Lombo and Kobe have value on this team, or any team. So rather than sending both down to the minors to make room for both Perez and Brown, it makes the most sense to send one down. The other should remain, to play utility infield, and in a pinch (or if they decide to start hitting enough) the outfield. They shouldn’t be the first guy you go to in the outfield, but even once a week would probably be alright. At this point Lombardozzi is in the midst of a season long struggle. He is hitting a ridiculously bad .224/.234/.283, which is barely better than what Espinosa has done this year. He also is a less able outfielder than Kobernus, although he has the benefit of a successful season in the Majors under his belt. Unfortunately that was last year, not this year. Technically after last night’s HR, Kobernus is hitting better than Lombardozzi. His .211/.318/.368 aint good, although it kills Lombo’s numbers. But he’s only had 22 PAs in the majors, so it’s hard to count that as too meaningful. In the minors, though, he managed to hit .333/.378/.420 for Syracuse this season. He probably deserves a shot in the Majors, and Lombo has done nothing to put himself above Kobe this season. So it makes the most sense to go with Kobernus, use him as you need him, and let Lombo go back to the minors and hopefully work out his swing. As for why defense should even matter considering this is LF and that’s where you move all your bad fielders I would say two things. First, you move your bad fielders there when they hit so much that you want to play them… but can’t stomach their defense in the infield. Hitting too much is clearly not the problem here. Second, if nobody is gonna hit, you might as well get people who can field. 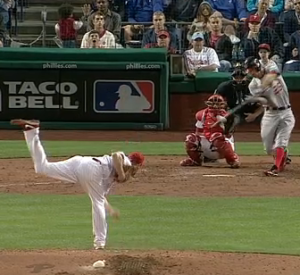 It was pretty clear that Lombardozzi had at least a shot at Kevin Frandsen’s line drive, 2 RBI single last night. It bounced about a foot in front of him, and he broke back early before coming in on it. Would Harper, Bernadina or Brown have caught that? I don’t know, but I know Lombo didn’t, and I’d be willing to bet they would have played it better. It has been said that the worst thing to be is a AAAA level 2B. Teams would rather carry a poor hitting backup SS, because he could more easily fill in at 2B. And with 5 OFs on a typical roster, AAAA level outfielders have MLB careers. Catchers always get shots, and corner infielders usually have enough pop to get MLB bench time. And of course, pitchers just below MLB level will get shots in the bullpen or as an emergency starter. But second basemen who aren’t good enough to start in the majors don’t get to play in the bigs. Unless, it seems, you’re a AAAA second baseman on the Nationals.